Home » Post Processing » Why Bother Shooting RAW If You Are Culling JPEGs? Let’s shoot in RAW, bracket the exposure, and try to choose the best shot picking the image the “old” way, which is based on the built-in JPEG, using the JPEG histogram, and the brightness on the screen. 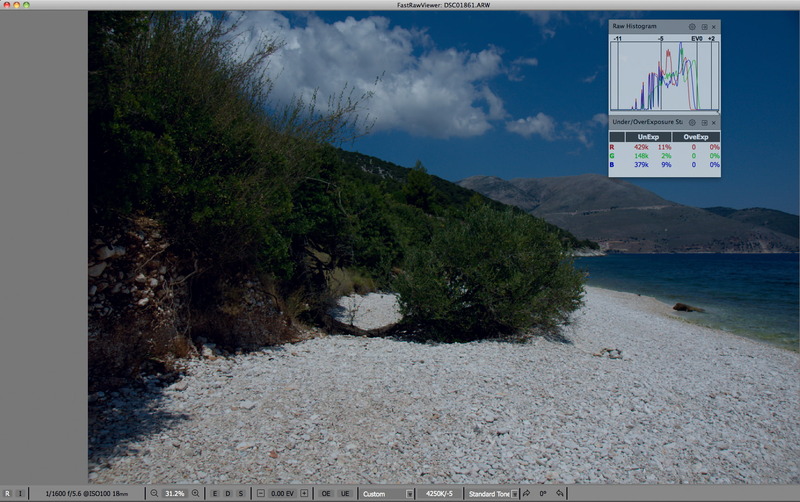 Looking at the JPEG histograms, out of the two shots, the shot #1861 (figure 1), is exactly what we need in terms of exposure (histogram just touching the right wall), while the second shot, #1865 (figure 2), is heavily overexposed on the pebbles and on clouds, lacking plenty of details in those areas; and the histogram for the embedded JPEG of the shot #1865 “climbs the right wall”, confirming what seems to be overexposure. Let’s have a look at the next shot #1866, where 1/3 EV is added to exposure compared to already “hot” shot #1865. We can see that we have lost very little – only 0.4% of pixels ended up overexposed, and only in the green channel. 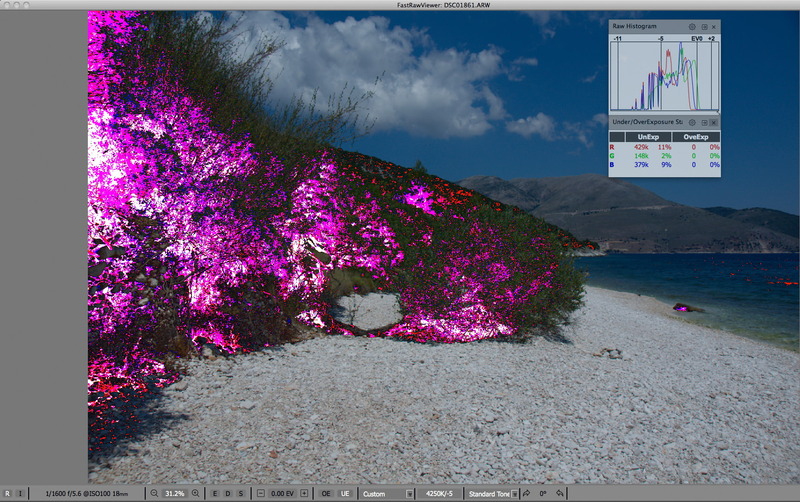 To see what are the overexposed areas on the shot we press ‘O’ on the keyboard, and magenta highlighting appears on the blown-out areas on the pebbles, below, figure 6. Let’s now explore the underexposure, evaluating the image areas below the 8 EV limit. To display underexposure highlighting we press ‘U’. the underexposure zone makes up about 1% of the total image area, which is completely normal. For the shot #1866 (figure 11), the overexposure zone is a rather negligible 0.5% of pixels. We can see that for the shot #1861 image (figure 12), the details in shadows are plugged to pitch black, while for shot #1865 (figure 13) and especially on shot #1866 (figure 14) they are quite usable. Basing our image selection on JPEGs we would end up with trashing the correctly exposed shots and picking a shot that is underexposed somewhere around 1.5 stops. This looks like a really useful piece of software- worth $15 to try it at least . Interesting stuff. I guess the lesson is – when in doubt, keep an image until you can open it up and view it properly. I have done experiments on my camera before to know difference between RAW file histogram and camera JPEG histogram. After taking several exposures in 1/3 increments, I got to know that the actual RAW histogram can store extra 2.7 EV before clipping highlights. Since discovering that, perfect exposure was always easy for me for my travel photography: bias my meter for +2.7EV and take spot reading from brightest point in the scene. Of course camera display shows my pic is all white but in Lightroom, the files always come out perfect ETTR with plenty of shadow details. But the exact EV value will vary depending on your camera model and make. Since UniWB is something I coined, I can tell you that setting b/w mode on a camera helps avoiding green tint on the camera LCD ;) However both Alex and I do shoot with UniWB, and here is where FastRawViewer is very helpful – simply because to cull through the shots taken with UniWB is very difficult unless the viewer can adjust white balance on the fly and propagate the custom WB setting to the whole shot if necessary. Another benefit here is that one does not need to re-establish white balance if converting through one of the converters that support white balance settings in XMP – like Adobe converters and RPP do. Interesting, but surely the JPEG preview on the back of the camera is based on the camera’s JPEG picture style settings (e.g. for Canon, Landscape, Portrait, Neutral, Failthful etc.) ? Which means that you need to set it to Faithful to represent the RAW file as closely as possible? JPEG previews are rendered taking white balance, sharpening, and output colour space parameters into account, too. You may want to set UniWB, sharpening to zero, and colour space to Adobe RGB to have more accurate previews. Still, if you compare culling based on previews vs. based on RAW – RAW is most certainly accurate. Thanks for the tips. I generally cull at home when I have a PC in front of me and can preview the files, but there are times when I need to cull in the field for whatever reason or need to absolutely nail the exposure at the time. I believe Magic Lantern do have a RAW histogram viewer embedded in the firmware so I might take a look at that and compare it with the standard histogram. When I need to “nail” the exposure I bracket the shot. But selecting the best one out of bracketed sequence is best done evaluating the histogram of RAW data combined with over- and under-exposure “blinkies” and statistics. Histogram does not tell the whole story as it is not correlated with the zones of the scene, so the question – is the overexposure zone happens to be on the subject or elsewhere can’t be answered based on the histogram. Same, it is hard to know how large the improperly exposed zone is. Beyond that, in cases like Iliah Borg mentioned where you want to examine the scene to see where your highlights are blowing, ML also gives you realtime RAW zebras which can show you where in the live image blown highlights (even colored per-channel), as well as areas of underexposure at or below the noise threshold for the given ISO. It can also display statistics like various SNR measurements, and the actual percent of clipped highlights (in hundreds). Finally, ML has a built-in spotmeter that can take samples of various measurements over a point or a region of the image. do you know the dark frame method white balance? i tried it and my photos in the lcd looks greenish.. i wonder if i imported this into LR i will have the right exposure.. i’m still experimenting things.. does uniWB and dark frame method really works? 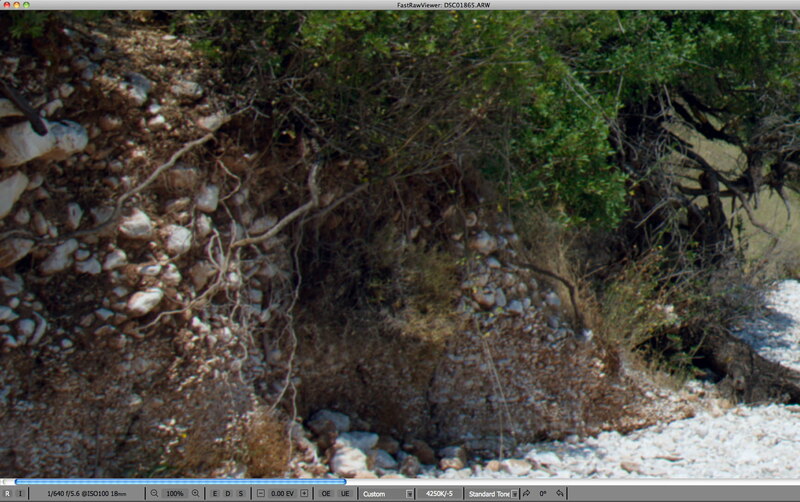 Is this whole issue avoided by simply shooting always in RAW and doing a .dng conversion on import? Conversion to dng does not solve this, as you can’t control preview rendering parameters (one of each is the hidden baseline exposure compensation). And you will still need to spend time in conversion to dng, and disk space for both conversion and including unnecessary shots in Lr catalogue. I understand. I do not use LR, but rather Daminion and ACR/PS CC including Bridge. For me this combination gives a better workflow than LR/PS CC. I have the dng conversion done on import automatically by the Bridge import utility making full size previews. My cameras are Nikon with default jpeg previews. What I think you are saying in the article is that the .dng (raw) histogram that I would first see in ACR is not representative of the exposure, essentially that if I look at the histogram on the camera, go through my import as above and view the image in ACR that the two histograms will be different. Have I got it? In-camera histogram, ACR histogram, and RAW histogram are three distinctly different things. Very interesting, particularly for many Nikon users as reportedly Nikon will be releasing new firmware for many of it’s cameras which includes adding RAW histograms. The original announcement set the release date as being today 1/19/15. It will be interesting to test it out with your article in mind. I glad you posted this article. Its something I noticed quite a while ago. I don’t cull images in camera ( I wait until I load the files into LR ), but I know many people that do. Thanks for posting !! I am a new photographer and I would like to say that I consult many different mediums for information, and this website is by far the best I go to. So thank you for putting out great content in a colloquial voice. I am a perfectionist by nature, and this article has me excited because I am mainly having issues with getting things correctly exposed. More than half the time I am not even sure which images are correctly exposed or not. I am confused with the unit of eV’s. I am an engineer, so I know these as the associated energy with the wavelengths of light, but how do they come into play with photography? Like I said, I have only been doing this for a month, so at this point should I even worry about this article? Currently I do shoot in the raw, and I try and do all my shots in manual mode, or A-priority (at this blogs suggestion, haha). Please let me know! Thanks! Furthermore I have LR, but this FastRawViewer program looks great. Is it worth purchasing this early? I’m might be complete newbie in this topic and this article is really confusing for me to wrap my head around. It doesn’t have one on one notes to picture correlation that this site follows on other articles. Would be nice to add complete settings under each picture so we get complete idea rather talking about just one factor like shutter speed or EV. Again it could be me being a newbie or a dummy not able to understand this easy enough on my first read. Will read again once I get home and update comments. This is a very compelling article. It is an aspect of photography I had not considered before. Why camera manufacturers don’t by default show a RAW histogram whilst shooting RAW seems foolish. Thank you for bringing this to my attention. The new firmware update of the D810 and D750 is going to address thiss, as far as I know. In fact the question is more about exposure meter calibration and in-camera JPEG processing; it is not always possible to look at LCD while shooting, while meter calibration for RAW and JPEGs needs to be different with current OOC JPEG algorithms. What I simply don’t understand is why camera manufacturers do not have an Auto-ETTR feature built into their systems if it is the correct way to shoot RAWs. The only article I found that might explain the reason for this omission is the following: howgreenisyourgarden.wordpress.com/tag/expose-right/ Any thoughts? It is impossible to implement ETTR without photographer’s deciding what highlights he can afford to blow out. Just downloaded the trial and am impressed with the capabilities. However, the 107 page user’s manual is rather daunting and if this is all about saving time so you can shoot more and fool around less, I think it would be great for you to write a quick tutorial of workflow from camera, through FRV and into LR and post it on Photography Life and/or the FRV site. For instance, do you just plug your camera’s memory card into a reader, open the folder from there and start editing? (I’m impressed at how the RAW images loaded faster than I could scroll if I just viewed them straight off my XQD card.) Can you add ratings to the memory card, sort out only the keepers, then just import those to LR or do you dump all the files on a separate drive, run FRV from that, then import to LR for dng conversion? Is there a grid view of thumbnails possible? What about side by side comparisons of two similar images? We are working on adding filmstrip. 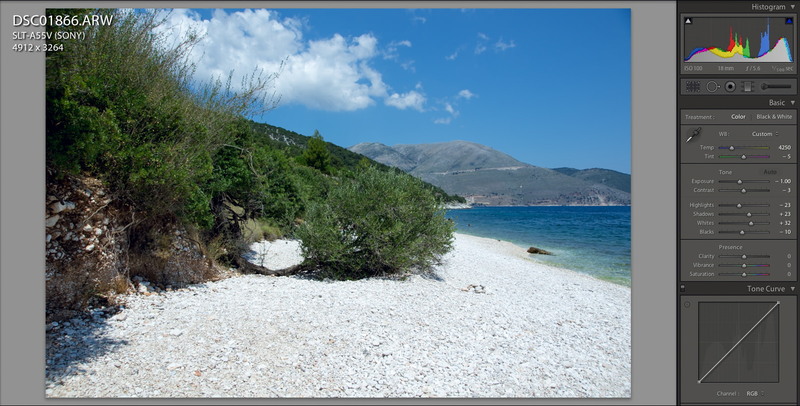 As to comparing several images side by side, we will implement it but it will take some really serious work. Fortunately, after the initial filtering, the shots to compare in that way are not so many and this can be done in Lr. I know this is a long-debated topic but I just had to ask this here again, is ETTR the right way to do it? I mean, before knowing about ETTR (which I did after I posted about this on the UglyHedgeHog forum), I’ve always read that it’s always better to underexpose than overexpose. I read that in many articles on PetaPixel, Fstopper (Dani Diamond being one author I remember as of now who recommends this method), and many other places. Especially as I shoot Nikon, and they say Nikons have more dynamic range, it’s better to shoot underexposed because Nikon has more data in the shadow areas. I was blown out after receiving the responses on my forum topic that it was actually better to over expose, or the ETTR term. After researching on the web I figured out it was yet another debate like Nikon vs Canon or Mac vs PC. On an article at PetaPixel, an author wrote about how Nikon can retain more data in shadow areas. The comment section was full of Canon shooters saying that Canon does the same thing but with the highlight areas. So if you shot Canon, you’d get more data out of highlight areas. If you shot Nikon, you’d do the opposite. Now, given that most people shoot Canon, I’m guessing that’s why the ETTR technique was invented? Because Canons retain more data in highlights? Or is that the basic way digital sensors work? I mean, does it matter/differentiate based on what camera I shoot if I were to decide whether to shoot underexposed or overexposed? And, should I shoot underexposed or overexposed in a slightly manner? Thanks for any help. I’m an enthusiastic photographer with an entry level camera and I can’t get my head around this. Every time I shoot I’m in constant dilemma what to do. This scene must be exposed to the right because of the nature of the scene. It is right with both film and digital. Light is digitized in such a way that every “right” stop has double the resolution of every subsequent “left” one. Paradoxically human sight is more sensitive to shadows rather than highlights so a proper exposure results in a lot of “wasted” resolution. Pictures exposed to the right will contain more detailed information which translates to better quality at the extremes. Not so simple. The highlight portion of the working part of photon transfer curve may well be non-linear at base ISO. 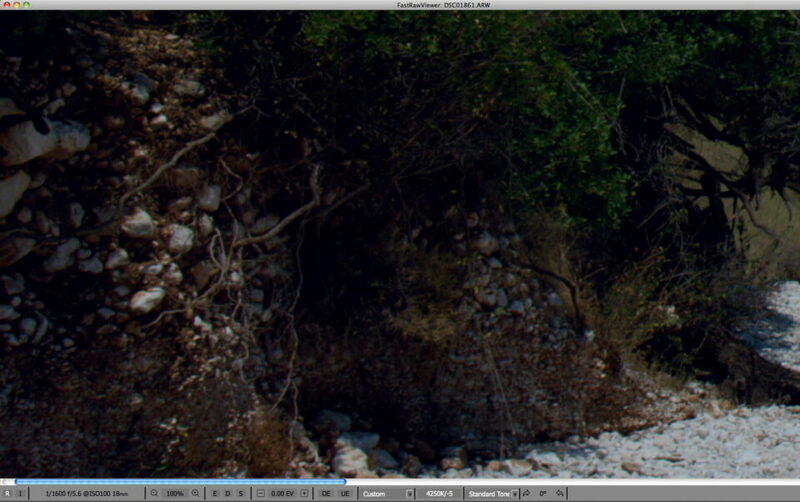 In that case unwarranted ETTR (that is, exposing a low contrast scene to the extreme right) damages the colour. Another issue arises when a twisted colour transform is used – result is substantial colour difference between the “normally” exposed shot and ETTR shot, with ETTR shot showing wrong colour. Great article. i am struck by how the process you describe is comparable to using the zone system with large format 4×5 film. In both bases there are decisions you make to create the image you want. The process takes time to learn, starts with visualization & measurement of tonal range at exposure, and carries through to production of the image! For landscapes i may start carrying my hand held spot meter again! This is definitely food for thought for my workflow. I love the speed of PhotoMechanic, but now it feels like I’ll be hindering my ability to pick/cull because I really can’t rely on the exposure and histograms in it at all. A lot of my shots are bracketed landscapes so this is a big problem. I might have to go back to doing everything in LR.